The gardens are open Monday to Friday, 12-5pm, 1 April to 30th September. Tickets are £5.00. The garden at Owlpen is an unusually complete survival of an early formal garden on a manorial scale. It has been described by the landscape architect Sir Geoffrey Jellicoe as possibly the earliest domestic garden in England to survive in something approaching completeness. And, however that may be, certainly many visitors find the medieval atmosphere, and sense of romance and mystery, are overwhelming, with yew rooms, hanging terraces linked by gravel paths and uncomfortably steep steps, and always the hill impending steeply at its back. The garden -- properly less than half an acre and with few flowers -- has been visited, admired and written about by some of the twentieth century's most inspired gardeners, including Gertrude Jekyll, Vita Sackville-West and Jellicoe himself. 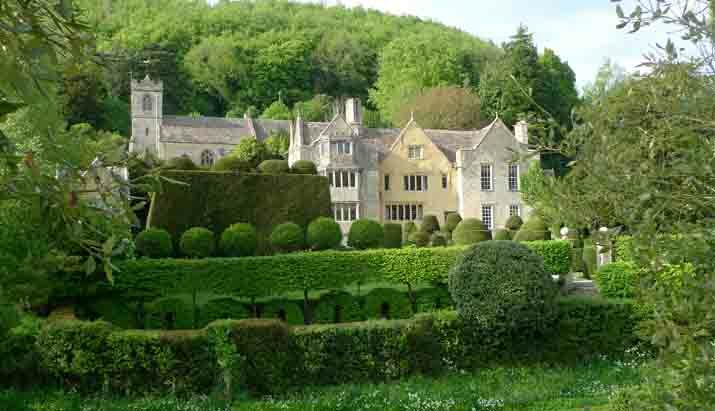 Owlpen, that tiny grey manor-house, cowering amongst its enormous yews, yews that make rooms in the garden with walls taller than any rooms in the house; dark, secret rooms of yew hiding in the slope of the valley. 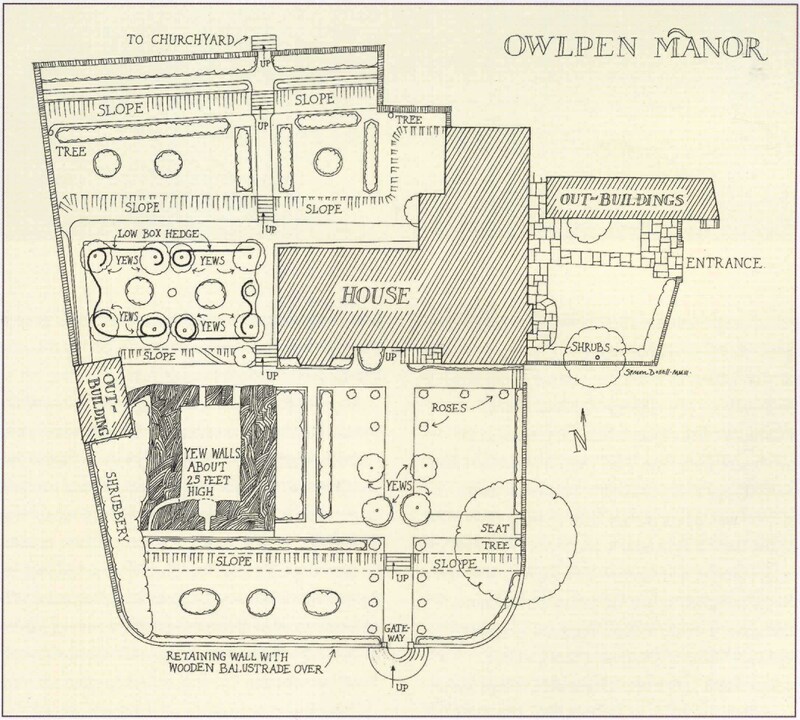 Geoffrey Jellicoe was moved by the Englishness of the Owlpen garden, with its medieval sense of mystery, intensified by the yews, and delightful simplicity and scale of plan, carefully recording a number of drawings, plans and bird's-eye views as a young landscape architect in 1926. The medieval garden is enclosed within the coped stone walls, still suggesting the hortus conclusus of the semi-fortified manor of the fifteenth century emerging into an age of increasing peace and prosperity. As Jellicoe noted, the core of the garden is certainly Tudor, with early Stuart additions: to the south and west it is laid out on the earliest principle, a repetition in plan of the forms of the facades projected either side onto the ground, with the Yew Parlour set in the angle between them. In the seventeenth century -- and, particularly, under Thomas Daunt IV from 1719 onwards -- the garden was reordered and classicized: the terrasses and raised walks were reformed, and the parterres laid out with strong axial symmetry. The main axis leads up from the flight of fine semi-circular steps, through the panelled stone gate piers to the centre gable of the south front. The gates were flanked by the original wooden palisade, costing £3 15s. 4d. in 1723, until the 1940s. Thomas Daunt's plantings from 1723 to 1730 are well documented for a garden of this size: he mentions pinks, Catherine peach, fool's coat tulips, a dutch herb and a holly tree. He recommends: "for ye pile, ye herb linaria [toadflax] prepared as an ointment". He bought a pair of "garden shiers" (and scythe) for 4s. 6d., also in 1723, no doubt to trim the maturing yews. The Yew Parlour (at various times known as the "Green Drawing-Room", the "Ballroom", "Dancing Floor" or "Wilderness") was probably planted by him, the small yews as accents in a formal parterre by the loggia of the Court House, known then as the "Summer House"; a Stuart gazebo, which also overlooks the lane. It already has its present form on the first engravings of the early nineteenth century. It is an "unusual feature", wrote Gertrude Jekyll, "the result of many years of growth and patient tending". The Manor was abandoned shortly after 1815, and about 1848 Owlpen Park, a new mansion to the designs of S.S. Teulon, was built on the hills, at the other end of the estate, a mile away. It has a commanding site with picturesque Reptonian prospects, evergreens, clumps and shelter belts. But the gardens at the old manor were kept up, when labour was plentiful, and we find it described as a "garden house", with a caretaker/gardener, Henry Grimes, living in part of the east wing. He tended the topiary yews, giving them their annual tonsure, and maintained the walled kitchen gardens, with their superior soil and fertility, for the Big House. Victorian photographs show the yews neatly trimmed, the garden carefully cultivated as a self-consciously romantic idyll, a destination for picnics and after-church excursions for house parties. Four yew pylons in front came to dominate and conceal the manor house, which "cowered", as Vita Sackville-West described it, amongst them. When they were removed in the 1950s, Christopher Hussey wrote a teasing verse to the then owner, lamenting the passing of the "introvert Owlpen of yore . . . though I like yew, I really love you even more". The garden retained its old-world charm after Norman Jewson's restoration, becoming widely recognised on both sides of the Atlantic between the Wars. The garden in which Owlpen Manor House is set, and with which it is so inseparably associated, is one of the finest and most satisfying things of its kind anywhere to be found . . . straightforward and simple and completely convincing in its coherence of form and logical arrangement. The present "Old English" garden has been recreated by the owners among open lawns and a field since 1980. There are box hedges enclosing quarters of English parterres -- having plots of grass-- like those in the Stoke Edith tapestries, or Kip engravings. The planting is traditional, with herbs and aromatics, old shrub roses and garden favourites, and the box, holly, juniper and yew replanted, as well as formal features-- a stilt hedge and pleached allee in lime and hornbeam, and sculpture by Simon Verity. The design makes use of old plans and records, suggesting an early garden reordered conservatively at the turn of the eighteenth century, just when the formal tradition was about to be swept away, in fashionable gardens, by the landscape garden. The mill pond walk recalls the early Georgian Elysium of rills and meandering paths. Two thousand young trees were planted as shelter belts to mark the millennium. The theme of the hanging gardens on seven terraces was said to represent the Seven Gardens of Paradise. They rise from the lowest terrace by the Ewelme brook, the wilderness of undifferentiated, untamed nature outside the garden, each terrace dedicated to a presiding deity, from Diana (the wilderness below) to Apollo (the church-yard above); in the enclosed garden proper are five terraces, representing the ordered perfection of nature. In the centre of the upper terrace is a narrow gate, like the Needle's Eye, which leads up to the Paradise Garden in which the church stands, ever dominating over the sublunary garden world. The twelve yews of the Yew Parlour were said to represent the Twelve Apostles, like those at Packwood House; and the four that once stood in front of the house were said to represent the Evangelists. Nineteenth-century commentators extended such correspondences in a way which today seems whimsical. . . The architectural form, with the house and garden closely interlinked -- the terraces rising in tiers, like a medieval vision of Babylon, edged with box and accented with clipped yew -- was also intended to be seen as set in the landscape, from across the valley in front of the house. From here, in its "narrow hand-carved valley" (as the local poet Ursula Fanthorpe describes it), it has a sculptural quality as a whole, which would have been more pronounced before the outsize Yew Parlour obscured the terraces behind. The group is entirely enfolded by hills ... as though the design has grown from the hillside ... similar to the idea of growth in Gothic architecture ... for this early garden is better related, in its romantic setting, than that of any other period to the countryside in which it stands.